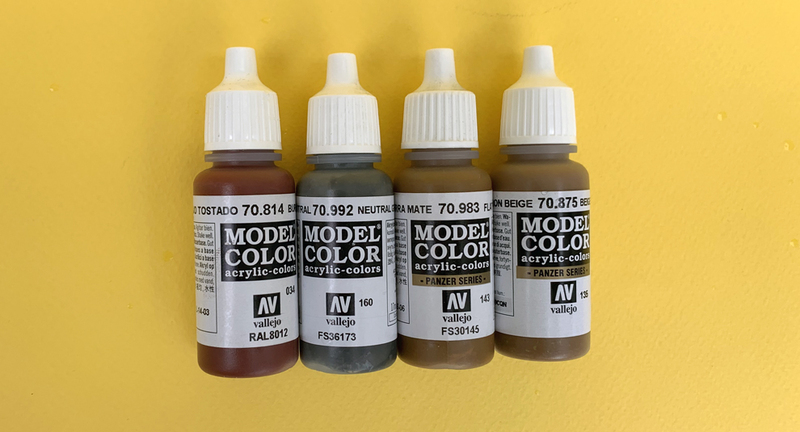 The very large line of acrylic paint from Acrylicos Vallejo (AV) has come into focus for model railroaders in recent years, in the continuing aftermath of the 2013 demise of Floquil, once the most widely used paint for railroad colors. To take their place, there are a number of new paint options. To begin with, there are the traditional types of solvent-based paints. There is the generally excellent line from TruColor, though some find these paints hard to use (I have not had any problems). There is a very nice line of paint from Tamiya, which I have commented on before (my post at: https://modelingthesp.blogspot.com/2018/08/a-shout-out-for-tamiya-products.html ). And of course, Scalecoat remains available, an excellent line of paint in many ways, as do Star Brand paints, and I use both of them myself for some applications. But Vallejo paints (vuh-LAY-ho), the subject of this column, are water-base acrylics. Paints of this kind have always had their place in the model railroad landscape, most commonly in Floquil’s former line of Polly Scale paint. Today, if the topic is acrylics, one may well think first of Vallejo paints for specific gradations of color. (Artist’s tube acrylic paints, such as the widely used Liquitex line, are long-running standards in the art world. I rely on them myself for weathering applications.) 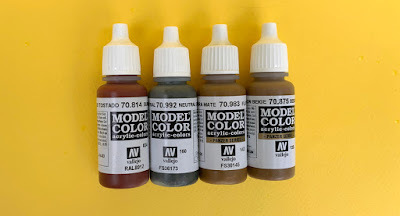 But returning to Vallejo, if you are interested in an introduction to this line, you can visit the AV site, and they offer a number of nice, downloadable paint charts and introductions (see those at: https://acrylicosvallejo.com/en/downloads/ ). Before going further, I want to warmly recommend the very nicely done and complete “Guide to Acrylic Painting” (subtitled “. . . in a post-Floquil World”) by Joe Fugate of Model Railroad Hobbyist. This is a PDF document available from the MRH website if you are a subscriber (standard subscriptions are free); you can download it from this link: https://model-railroad-hobbyist.com/subscribers-only/painting/acrylics . The first colors I wanted to try were some that I could use as scenery colors (brown and gray), along with something that was recommended as an okay Boxcar Red. The containers have an eye-dropper like dispenser under the lid, which allows storing these paints for extended time. The colors shown are all Model Color, from left to right, they are Burnt Red (70.814) and Neutral Gray (70.992), both in the Acrylic Color series, and Flat Earth (70.983) and Beige Brown (90.875), both in the Panzer series. These are just four examples of a very wide range of colors. I have already purchased and used other AV colors, such as U.S. military Olive Drab, for military vehicles. I have used these colors so far with brush application only, and have not yet had occasion to thin them for airbrushing, though I feel confident that there will not be problems. They are very good, intense colors and quite opaque as applied with a brush, all you could ask in that kind of application. They seem to adhere well to various materials and are self-leveling and pretty quick drying. For background, although AV is headquartered today in Spain, the company was founded in 1965 in New Jersey, before moving to Spain in 1969 to serve primarily the cartoon film industry in Europe (in the day before digital film making, when those cartoons were painted). By 1972, the first professional artist’s acrylics were marketed by AV. Needless to say, these are high-quality paints and are not just hobby products. The company remains a family company, still directed by Amadeo Vallejo, and today their paints are sold world-wide. These paints are readily available on the internet, but if, like me, you prefer to visit a store to see the colors in person, your best bets are war-gaming stores and plastic military model stores, along with good-quality art stores. Most model railroad hobby shops do not carry Vallejo paints, at least at this writing. Of course, once you know that a particular Vallejo color works for one of your specific applications in modeling, you can obtain more of it, or Model Air instead of Model Color, via the internet. If you have no experience with acrylic paints, I urge you to give these a try. True, the colors are not model railroad colors, but you can use the Model Railroad Hobbyist download I mentioned to come up with reasonable color matches to the more familiar railroad colors. Vallejo paints are high quality and I recommend them. I've been wanting to try their line of paints. I hope you post your results once you try spray painting with their product. The reports I've read thus far are promising.